Day 3: Can the Tablet come out and play? Today is day 3 of running the Windows 8 Build tablet. Apparently I am the only person in Hong Kong with the Build Win8 tablet and everyone I know in Hong Kong wants to play with it. Some Telerik customers read my blog post from yesterday and asked me if they can play with the tablet too. 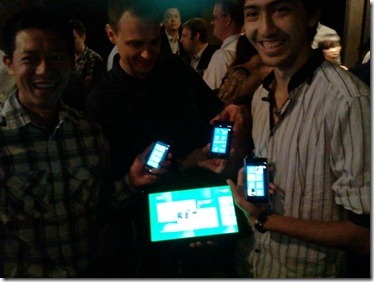 I set up a meeting at a local pub in Hong Kong to allow some Telerik customers to play with the tablet. So today, the tablet went into the wild. I was a little early to meet our customers, so I hung out at Starbucks. Just about all of the PCs in the Starbucks were Macs. I whip out the WinPad and it turned a lot of heads. One guy even came up to me and asked me what type of tablet I had. I did an impromptu demo since I was in the middle of a tweet war with some Telerik colleagues back in Bulgaria. Passed the tech elite/Starbucks test. SMS from our customer, so time to meet at the pub. When the Telerik customers showed up at the pub they went to work with the tablet. They liked the desktop mode option and we got into a long discussion on Metro only vs non Metro only devices. Played a little with Visual Studio and looked at the references for a native XAML app. Spent a lot of time on Metro. We all agreed that if Win8 delivers as promised, Apple has a ton of completion on its hands. After an hour of playing and talking, I can say that it passed the enterprise customer test. We’re late for a networking event, so it is time for the next pub. There is a monthly networking event in Hong Kong called Web Wednesday where the techies and social media types gather around and talk shop. When we walked into the pub, I bumped into Furuzonfar (Foo-bar for short), a buddy of mine who is a student in Hong Kong University. 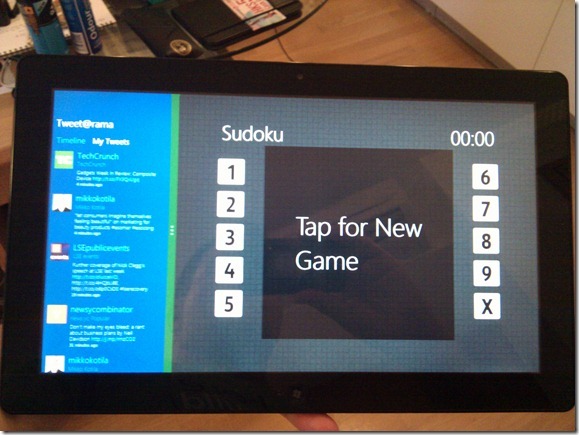 Furuzonfar is an avid WP7 user and took the tablet for a test run. Pretty soon there was a circle of people around him and they where playing for a long time. Passed the college kid test. A guy from Intel came by and played with it for a while too. He was happy that it was running an Intel chip. Then some other WP7 enthusiasts came by and I had to snag a photo. Suddenly WP7 is a lot more compelling. Furuzonfar was generating so much attention that a reporter from the Financial Times came by and wanted to know what was going on. I wrestle the tablet away from the college kids/Intel dude and do a demo for the FT reporter. She particularly liked how you can snap an app to the side of the window. As a mac user, she was impressed, so it passed the reporter test. Finally it was time for the tablet’s field trip to end and I headed home. All in all, a lot of activity for a tablet in one evening. I head home to New York for the weekend and will see if it passed the hardest test of all, the Mom test. 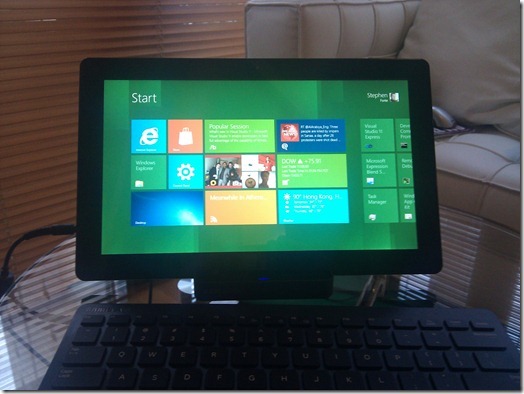 Yesterday I blogged about using my Windows 8 tablet as my main machine for work and device for play. Today I will share my experience in using the device for building a Metro app. The first application that I ever wrote was 19 years ago for the Timex Sinclair 1000. (I can’t believe that I am that old!) I’ve come a long way now writing for a touch enabled device (but the TS 1000 was about the same size of an iPad.). Keeping with tradition, I will write a simple “Hello World” and see how it goes. 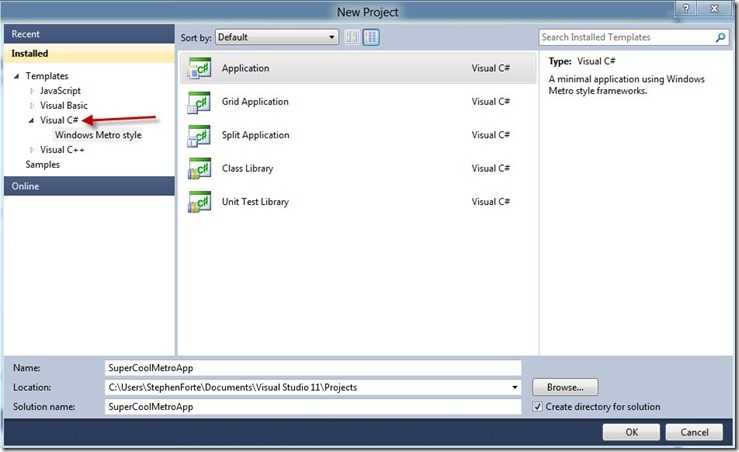 When you load Visual Studio, you will notice that there are only Metro project templates. I select Visual C# and the most basic type of project an “Application.” This is a blank container for a Metro application. I could not seem to open the project in Expression Blend 5 Preview, so I had to code the XAML by hand. I inserted a Button and a TextBlock. I’ll do the classic “Hello World” using a tapped event. <Button Name="MyButton" Content="Metro Button" Tapped="Button_Tapped"
After fiddling around for a while, I realized I was thinking way too much like a Silverlight/WPF developer and not a Metro developer. I quickly discovered the “Tapped” event and wrote an event handler for it. //my first C# code for WinRT! Time to run the app. I hit F5 and took a video for you to enjoy. Notice that I swipe to get back to the desktop mode after I am done using the application. Cool. That’s it! In just a few easy steps, I became a device/tablet developer. Try that in Objective-C.
Today was my first day back in the office for my job at Telerik and I decided that I would try an experiment. I would use only my Windows 8 tablet that I received at the Build conference last week for both my work and play. I put away my Lenovo laptop (for work) and my iPad (for reading in bed) and decided I would use only the tablet for the next few days. The tablet came with a Bluetooth keyboard and dock, so I put that together and started to play around. I had to install them in “Desktop” mode and they showed up in the Metro Start menu. Cool. My day started with doing regular emails back to the Telerik offices around the world, so I did that through Gmail and Outlook Web Access in Internet Explorer 10 in the Metro mode. Quickly I realized that I don’t need a mouse, but have a USB mouse nearby very handy. Telerik’s CEO popped up on Skype to talk for an hour about Build and other things. Worked just great, I forgot I was on a prototype machine. Skype only worked in Windows Desktop mode though. It would be great when Skype is a “live tile” and gives me notifications and messages. I then went into Visual Studio 11 Express that came included with the machine. Built a few simple Metro applications with XAML and C# and .NET 4.5. I felt like I was building Silverlight or WPF applications, it was pretty straightforward. (More on this in the next blog post.) I tried to share a screen shot of the application on Facebook via Socialite (the built in Facebook app for Metro), however, there was a bug there. I played some Sudoku with my Twitter feed docked on the side, great for my ADD! The key thing that I realized after one full day with Windows 8 is that the new Metro UI is the main experience. Even if you are going to use Windows 8 in an enterprise with just the “Desktop” mode, you will interact with the Metro UI as your “Start” button and application launcher (I played around with a mouse and keyboard for a few hours and the Metro UI worked fine with a mouse and keyboard). I am thinking about in the future if you are using a Win8 PC at work and you also have an ARM based Metro-only Win8 tablet/pad at home. The UI and experience are exactly the same for most of your operations. That is pretty compelling. Lastly I wrote this blog using Windows Live Writer. Time to call it a day. 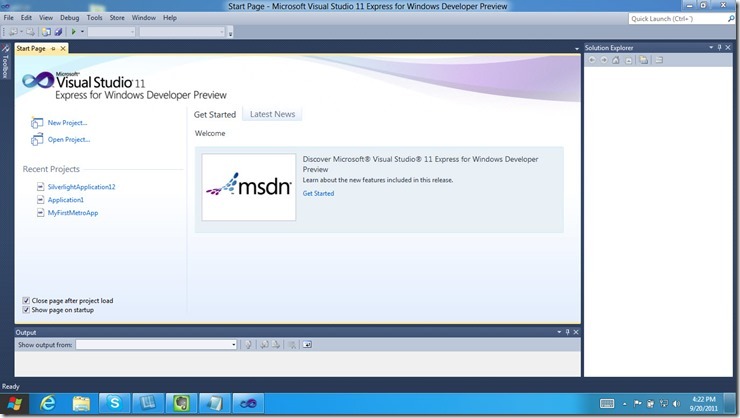 Tomorrow I will post my experience using the Visual Studio 11 Express edition.